here is no doubt, a portable computer is a must for business people. Such machine is expected to be reliable, provide security for your business data and always be around when needed. This video review presents the machine that I just described. 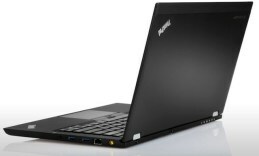 This is Lenovo ThinkPad T430u laptop. The sturdy aluminum construction of the case is what makes the first impression. The edges are sharply cut, contributing for the classic appearance at only 0.8mm thickness. The case surface doesn’t easily attract fingerprints and dust. The ultimate purpose of the hardware is to provide the best-in-class business performance. You are free to make this machine as powerful as you want. It is supposed to support up to 8GB of DDR3 RAM and up to 3rd generation IntelCore ultra processors: i3, i5 and i7. The graphic card’s choice is also all yours – you can put on board either Intel HD Graphics 4000 or NVIDIA® GeForce® GT (1GB). They both provide excellent visual performance, it will be brought to you by the 14’’ HD AntiGlare screen. Its resolution is 1366×768 pixels and features an LED technology. The ultrabook’s basic purpose is the explanation to the pretty narrow viewing angle. The hard drive storage inside this business-orientated machine can provide up to 500GB HDD or128 GB Solid State Drive. The good audio quality is guaranteed by the Dolby® Home Theater® v4 technology that brings a realistic surround sound. Not only the sound, but the HD web camera with Face Tracking provide a multimedia experience at a high level, not typical of business class machines. For excellent communication comfort there is also a dual-array HD microphone. The keyboard is island-style one with larger keys that provide a pleasant typing experience as they keys are flexible and have a short stroke. In the middle one can hardly miss the typical Lenovo trait – the trackpoint. For those who haven’t used one I will explain: it is a cursor control device found in ThinkPad computers and was originally introduced by IBM in 1992. It is the touchpad’s alternative. However, for touchpad users Lenovo has provided on just below the keyboard. On the right hand side your security is further increased by the fingerprint reader. The opening mechanism is stable and runs smooth, it can open at the maximum angle of 180 degrees. Since durability has been Lenovo’s trade mark for a long time. Being a Lenovo product, the Thinkpad T430u ultrabook also brings to you this toughness. It passes 8 military-spec tests to fit the reliability needed for a business machine. Talking about security and durability we must mention theBIOSPortLock and USB Blocker features. The weight of this great business companion is 4.08lbs. Lenovo guarantees around 7 hours on the 3-cell battery inside this ultrabook. The ports available along the case edges are 2 USB 3.0, HDMI port, 4-in-1 SD Card Reader and aMiniDisplayPortwith audio. The operating system on Lenovo ThinkPad T430u can be Windows 7 the Professional and Home premium version at 64 bits as well as the brand new Windows 8 or Windows 8 Pro. Did you enjoy this article? If so, we’d love to hear your thoughts in the comments below. It would be great if you subscribed to our RSS feed or signed up for email updates to get more goodness. There’s lots more where this came from! Copyright © 2019 Digital Magnet, All Rights Reserved.